New York via-Bay Area artist MNDR a.k.a. 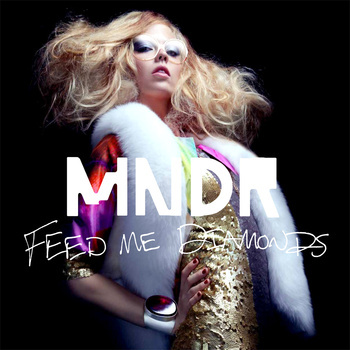 Amanda Warner will release her highly anticipated, debut full-length album Feed Me Diamondson August 14, 2012 via Ultra Music. Feed Me Diamonds, produced by Peter Wade and mixed by Tony Maserati (Beyoncé, Lady Gaga)was a labor of love, with nearly all of the sounds and beats on the record designed from scratch. The album is an ode to heartbreak and decadence with nods to MNDR’s pop sensibilities, love of early house, minimal techno and IDM. MNDR released single and Patty Hearst tribute “#1 In Heaven” at the top of 2012. Amanda puts it simply, “Pop music is a platform to say something. You don’t have to only talk about parties.” Feed Me Diamonds is the result of Warner and Wade’s tireless efforts to translate raw emotions into music that grooves without excess glitter. The pair first teamed up in 2008 after discovering a mutual love of gear, sci-fi, and cults. Warner studied classical piano and bass as a kid in North Dakota and got her start in a Minneapolis noise band before moving to California and immersing herself in rave culture. When she relocated east to design the Yeah Yeah Yeahs’ touring synth rig, she met Wade, a young studio vet who’d seen it all as an in-house producer and engineer for Sony Music under Tommy Mottola.